How about building a hood? Post subject: How about building a hood? I was looking at my recently acquired buggy and thinking something just doesn't look right with it. I was thinking maybe a hood might make it look a little more complete. Here's is a quick drawing I whipped up. The yellow lines are showing tubing for a frame. Then I was just going to cover that with the appropriate sheet metal. 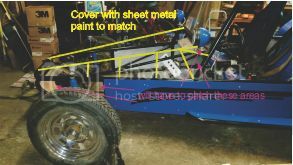 But to keep from making it just square I thought I would weld my main down tubes on the inner sides of the windshield lights from the lower windshield frame to the front bumper. That would make the sides of the hood come down at an angle. I would need to make two patches at the windshield indicated by the pink arrows. And then I would also fill the areas near the front wheels. If my picture is too small I can make it a little bigger. Street legal 4 seat buggy. Post subject: Re: How about building a hood? My hood is made of sheet metal rather than aluminum. it does NOT have any sort of frame under it and is quite strong. I can stand on it. It hinges at the front so it opens for easy access. I've put a hood on my rail, but I added some 1"conduit for a frame for it. The larger horizontal frame tube that was there was a bit too low for my taste. And since I can't seem to make anything simple for myself, I added a separate forward section from the 1" round tube and some 1"square tubing (split into a shallow "C" channel edges). I used a heavy duty piano hinge in the middle so it opens like a regular hood. The forward opening part gives me access to the battery box, steering box and tie rods as well as the reservoirs for the brakes and clutch. I also added some hydraulic lift cylinders from the JY, just because I had a few pairs of them laying around. It's all just an exercise in futility though as this frame is tweaked pretty badly. The twist can be seen with the naked eye in the 3rd pic, as well as the next to last pic above. What the pics don't show is the front axle beam is also bent back noticeably. The beam is welded to the frame, and from the looks of it, was probably bent BEFORE the PO welded it to the frame. At least I learned a lot about how to make a body and hood from it. I'm planning on replacing the frame with a Beeline Pack Rat 2 seater kit later this year. I'll put that knowledge and experience to good use when I build the Pack Rat frame. Here's a link to the build threads if anyone is interested. or there's a condensed version here.